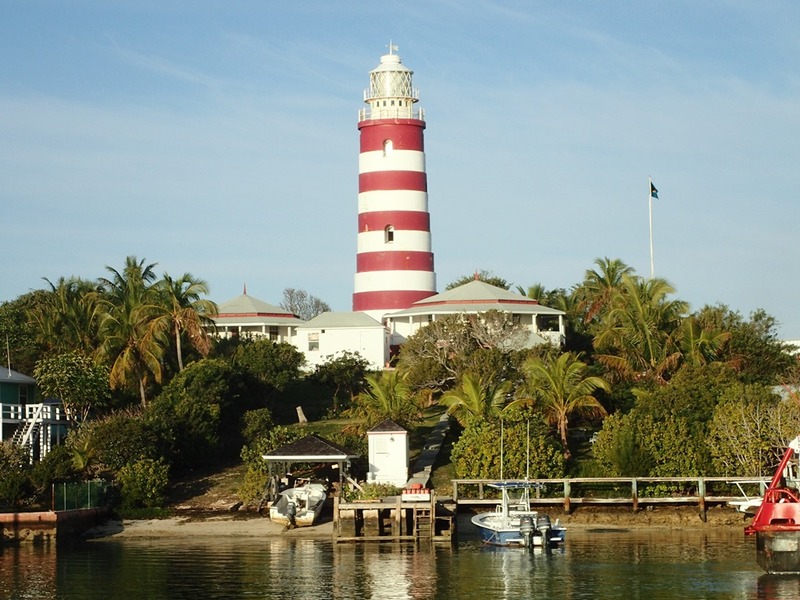 Hopetown’s iconic landmark is its candy-striped lighthouse, officially named the Elbow Reef Lighthouse. 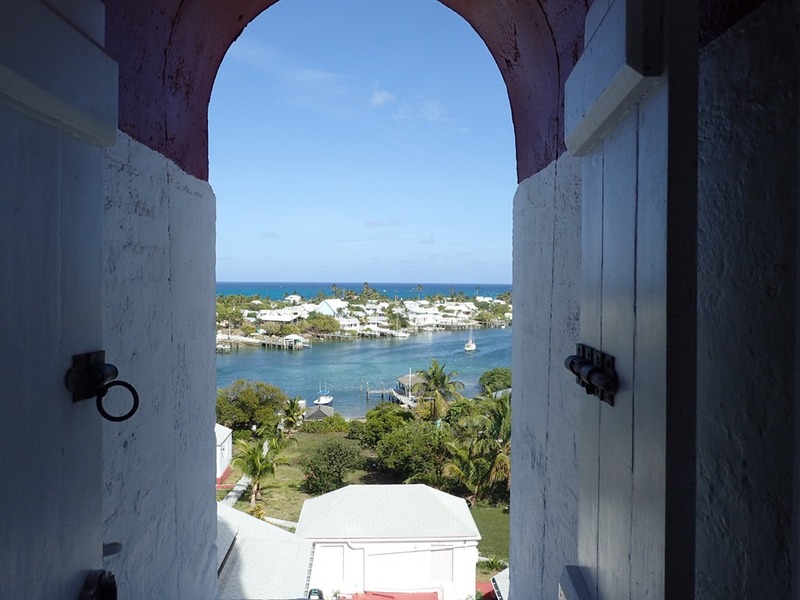 It was built in 1864, much to the chagrin of local wreckers and salvagers, who depended on ships foundering on the Elbow Cay reef for their livelihoods. 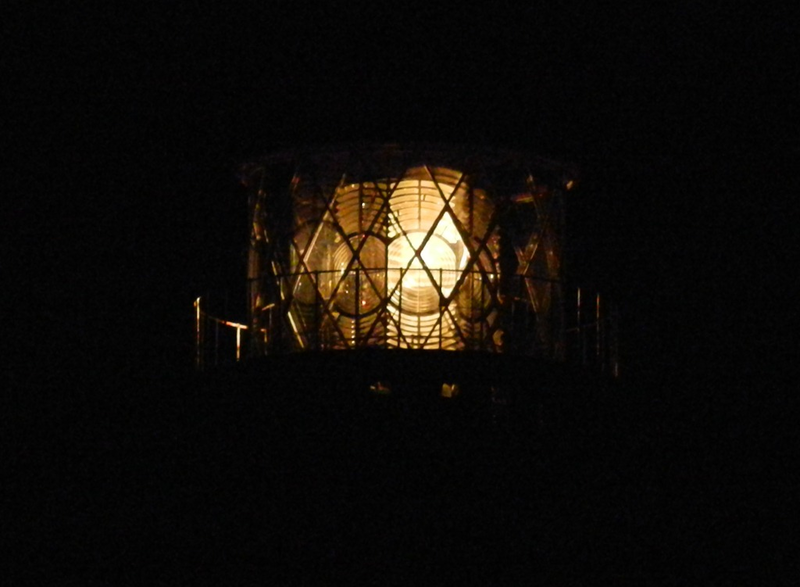 Its light, visible for 17 miles, sweeps the Sea of Abaco and Atlantic Ocean with 5 white flashes every 15 seconds. 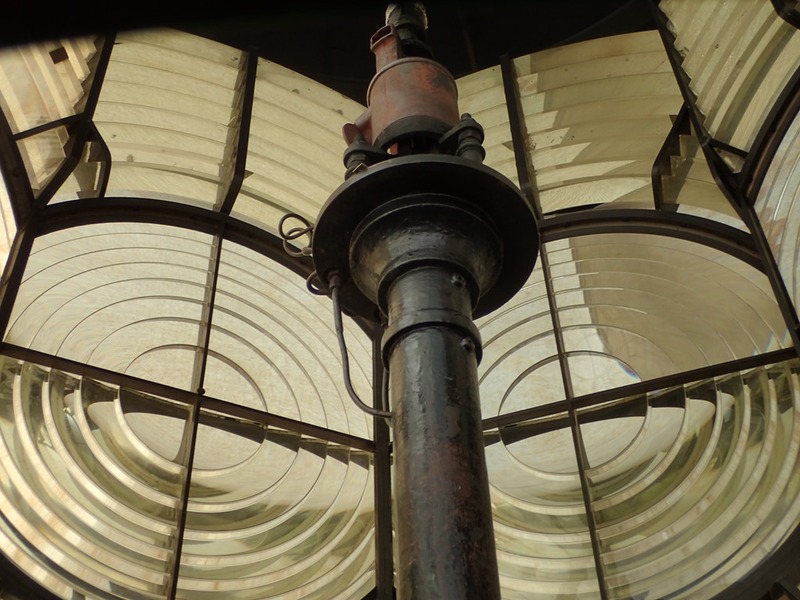 It remains one of the last manually operated kerosene lighthouses in the world, burning pressurized Kerosene oil with a wick and mantle. 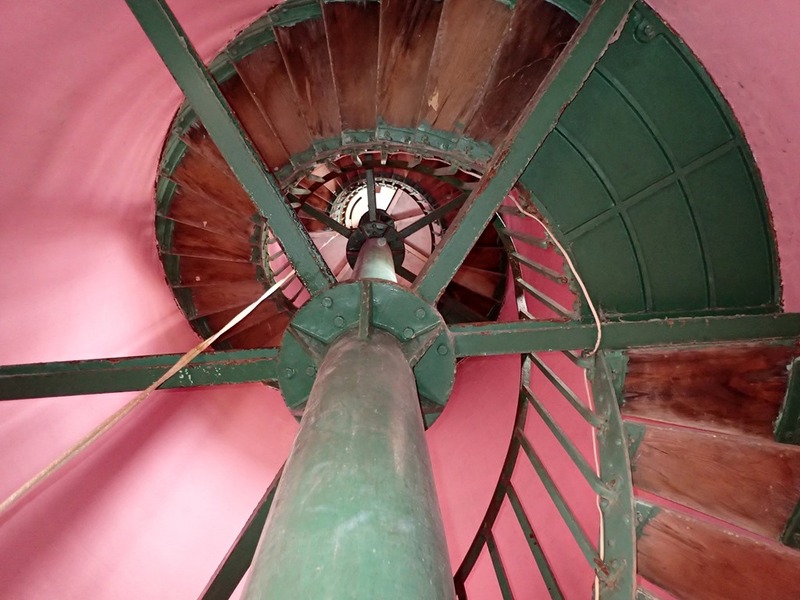 The lighthouse keeper must wind its weights to the top of the tower every two hours – all night long – to keep the light alive. 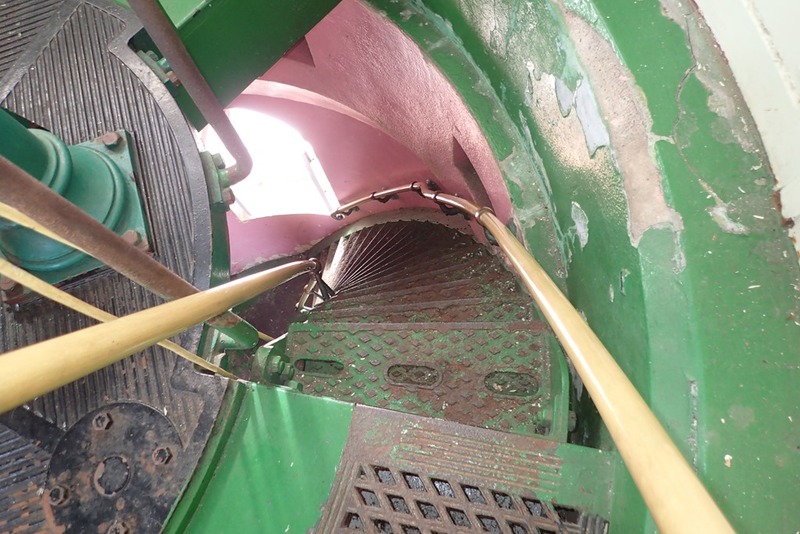 The climb to the top winds up its steep walls like the inside chamber of a nautilus. Windows along the way provide beautiful vistas. 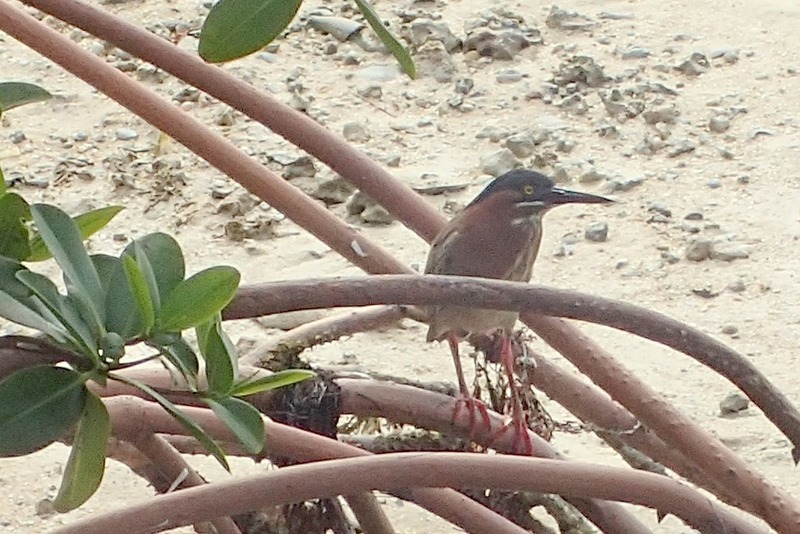 And landings to stop and catch your breath. The last 12 feet are an almost vertical ladder. 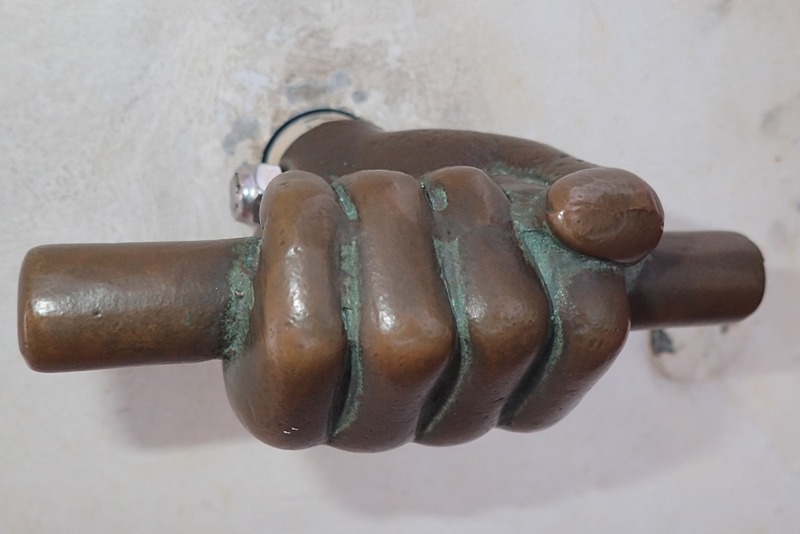 Once at the top, a little door, with this adorable cast bronze handle – in the form of a hand – allows access to an outside landing. 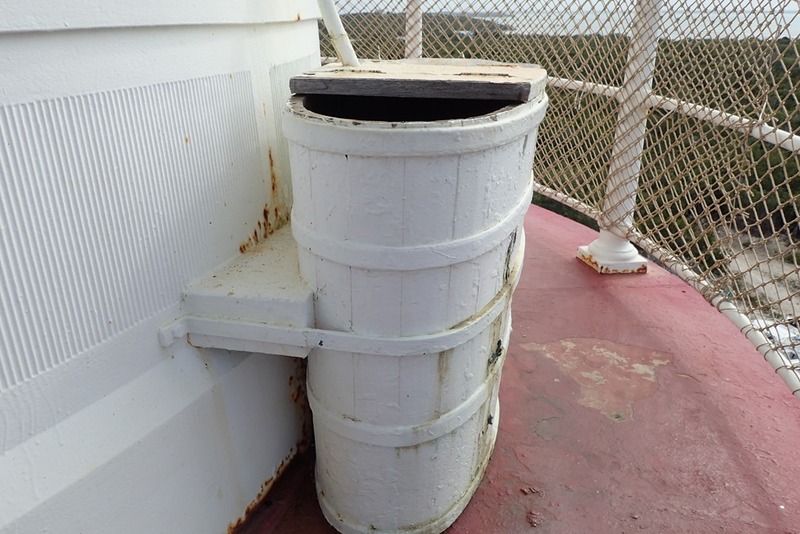 The landing includes a wooden cistern – part of the water catchment system. From the top, the views are incredible. 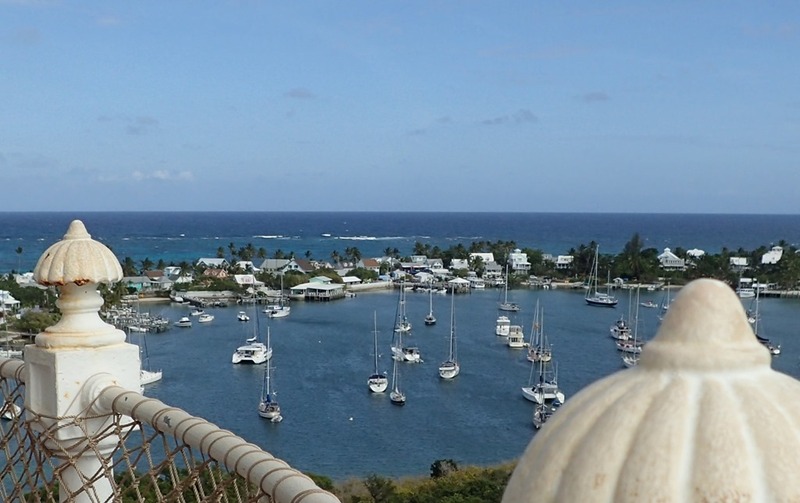 Hopetown harbor to the east, with the Atlantic Ocean and the reef in the distance. See the little ruffle of white water off the far shore? You’re looking at waves breaking over the reef. 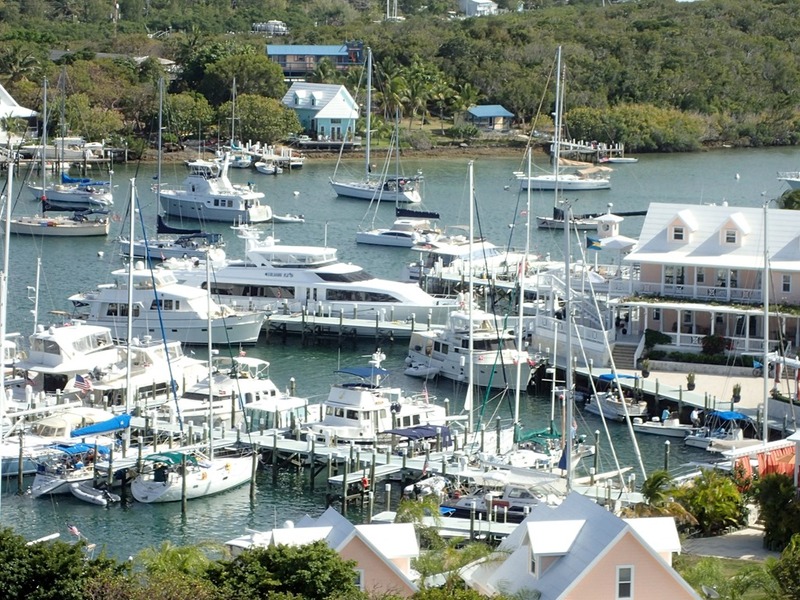 And the Sea of Abaco to the west. 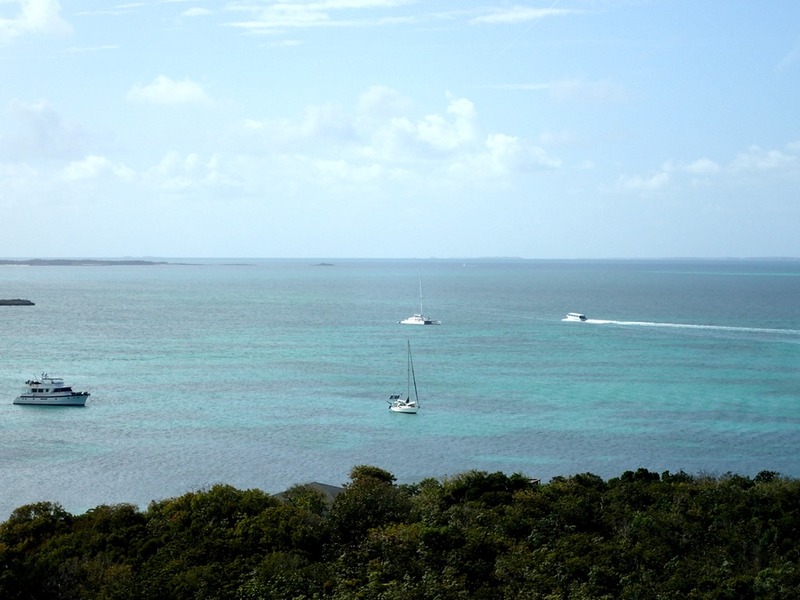 We can even see the marina where Motu Iti is tied – but our boat is so small you can’t really place her in this picture. We are on the farthest dock. Our forestay is blue and the white radar reflector is half way up. After our tour of the lighthouse, we wandered along a path towards the harbor entrance and came upon a wide wooden bridge to, we suspect, a housing-development-to-be. 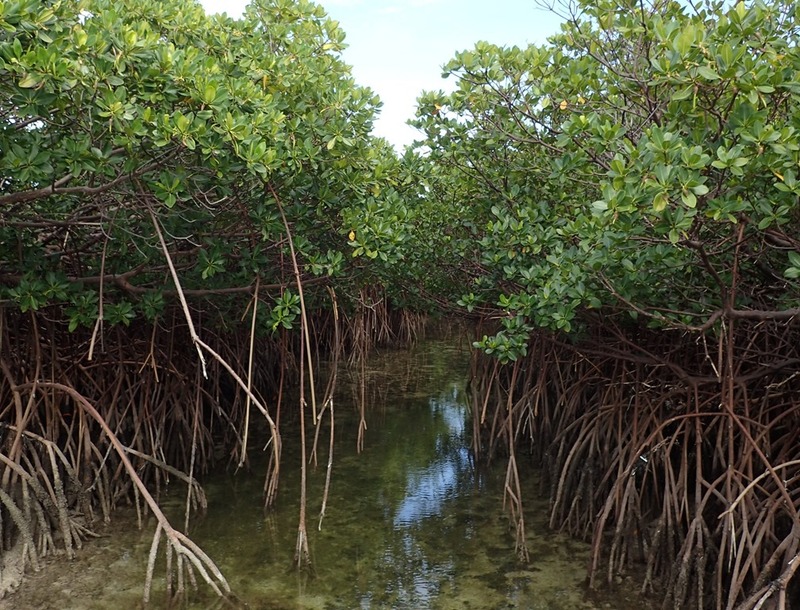 It was a great place to see mangroves. 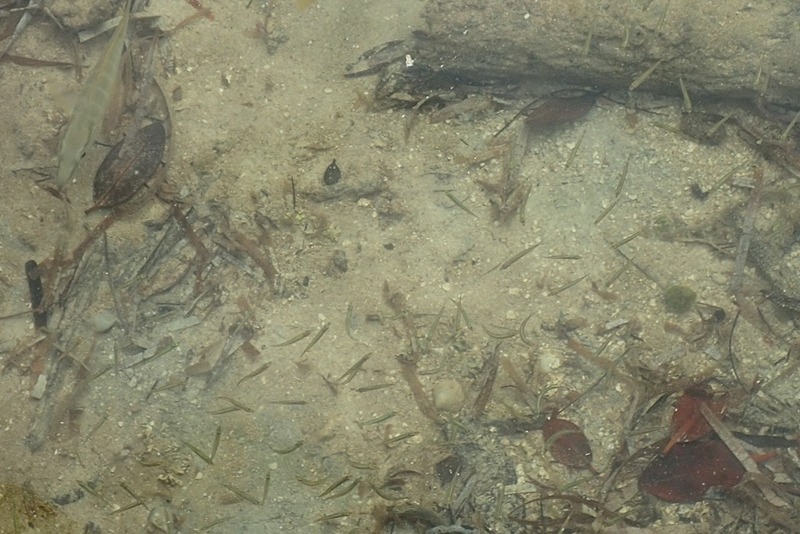 And tons of tiny fish caught up in a tidal pool, awaiting high tide. 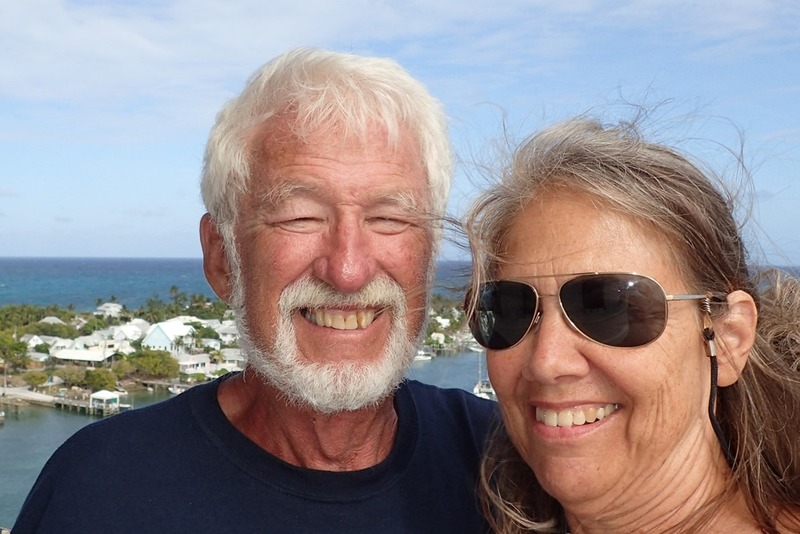 A beautiful walk on a gorgeous Bahamian day.